In time for Dan Berrigan's birthday today, a new book reminds us that, even as peacemakers age, their visions and guidance remain as necessary and urgent as ever. Thirty-three years ago this summer I was stopped in my tracks by the clarity and power of Daniel Berrigan’s words — and nothing has been the same since. Today, as Berrigan turns 93, the memory of that encounter comes back with all its vivid force. At the time, I was researching the impacts of nuclear arms for a book project, and as part of this work I visited many East Coast think tanks purportedly envisioning alternatives to the then-spiraling arms race between the United States and the Soviet Union. Each discussion I had with the researchers at these institutes left me more and more depressed. No one I spoke with could envision a world free of nuclear weapons. At best, they thought we might be able to stabilize the nuclear regime, or perhaps reduce it a bit if we increased conventional weapons. It was after four or five discussions like this that I contacted Berrigan and asked if I could see him. I knew his long-time history as an antiwar activist and I instinctively felt he might provide some way to balance out what I’d been hearing. He didn’t know me, but he graciously welcomed me to his place in Manhattan. There was a lifetime of experience behind these words and I felt both the simplicity and weight of them. Here was the prophet I’d heard and read about. And like other prophets, he didn’t let me off the hook. “Find some people you can pray with and march with,” he told me before I left. That mantra floated through my head for the next few months and kept boring its way into my soul. Eventually, following orders, I did just that — and my life took an unexpected detour onto a road of nonviolent transformation that I am still, in fits and starts, traveling. In time for Berrigan’s birthday is a new book that reminds us that, even as peacemakers age, their visions and guidance remain as necessary and as urgent as ever. 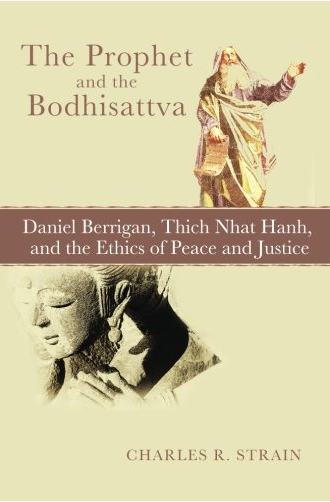 In this volume, the author, Charles R. Strain, pairs Berrigan with the iconic Vietnamese Buddhist monk and teacher Thich Nhat Hanh in an attempt to see what their wisdom might bring to a social ethics geared to transforming our contemporary world and its growing crises of war, poverty and climate change. It is clear that Strain has been deeply influenced by both of these figures, and he gives them their due in a lavish presentation of their fundamental orientations, illuminating in profuse detail how Berrigan’s life of nonviolent resistance embodies the prophetic vision that undergirds much of the Judeo-Christian tradition, while Thich Nhat Hanh, now in his mid-80s, has lived a life of engaged practice rooted in compassion that, like the traditional bodhisattva of the Buddhist tradition, resolves to save all others. But Strain is not content simply to present detailed portraits of these agents of change, or even only to compare them — which he does, for example, by contrasting in a sustained and illuminating analysis the “no” of the fiery Christian prophet with the “yes” of Buddhist mindfulness that, seeing the interconnectedness of all things, can dampen one’s proclivity to moral superiority. Rather, his larger project is to see how what Berrigan and Nhat Hanh have learned can complement or even reframe other approaches to building a just world. This question is personal for Strain who, though an activist himself, has spent 40 years as a professor and administrator at a university. 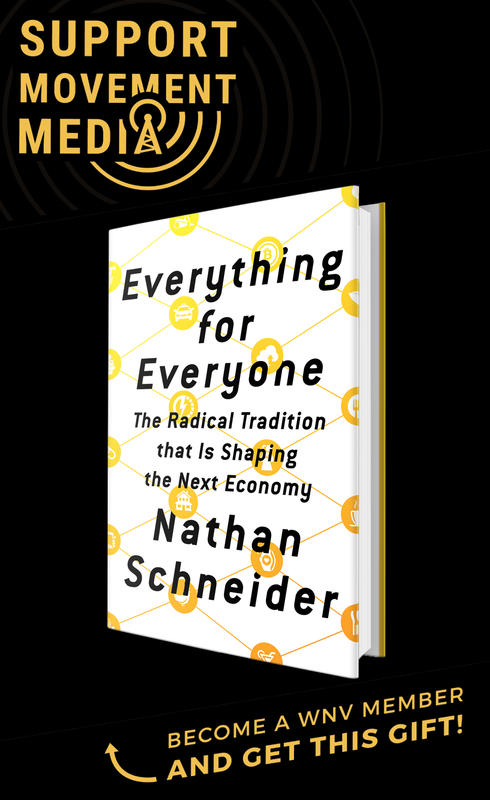 While his own experience tells him that academia and other sectors — religious, political and non-governmental organizations — can easily and uncritically affirm and be co-opted by society’s unjust structures and policies, he holds out hope that they may become what he terms “countervailing institutions.” They can be part of a mobilized network of agencies creating a more just and sustainable reality and, by implication, can even integrate something of the prophetic and the mindful into its approaches. In scholarly detail, Strain lays out new strategic frameworks for building this new world that are emerging from the academic discipline of peace studies and from growing transnational networks, including “just peacemaking” and “strategic peacebuilding.” There is much to recommend in these models, as Strain shows, but in the end he holds that if both the vision and mindfulness of the prophet and the bodhisattva are missing from these rationalized systems, they will be severely hampered. Why? Because what we are dealing with, as we plunge on into the 21st century, is not simply retooling a world a bit out of kilter but a planet facing, on the one hand, the oppressive consequences of empire and, on the other, climate chaos. Not only are these feeding one another, they are grounded in what Strain calls an overarching matrix. Anything short of a movement that is both prophetic and deeply mindful will not foster the thoroughgoing transformation and healing that is needed. While this book’s academic precision and detail are perhaps mostly geared to fellow social ethicists, there is much in this book which all of us can benefit from. First, Strain provides a comprehensive up-to-date overview of critical and explanatory work being done on Imperial America. This goes, as well, for its treatment of the climate crisis. In fact, if nothing else, this book is worth reading for these sections alone. But there is much more to this book than these important chapters. Charles Strain’s text helps us grasp in engrossing detail two paths toward the well-being of all still being trod by Daniel Berrigan and Thich Nhat Hanh. Even more, it helps us see how all of us are called to deepen this journey of inner and outer change.